There is nothing worse than going into the bathroom after some has had a shower and finding wet puddles on the floor, especially if you walk around your house in your socks. 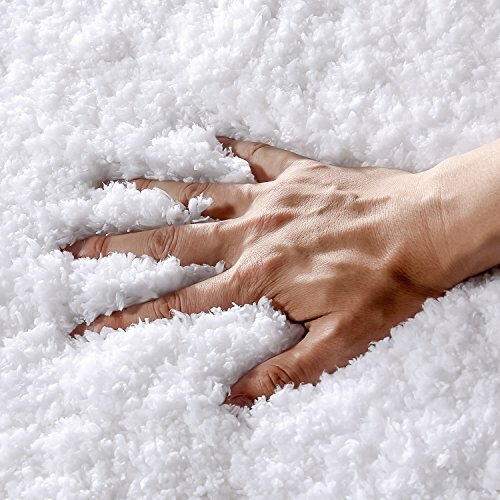 Selecting a great absorbent bath mat can be a vital step in ensuring the harmony in your home. If your main criteria is a mat that can soak up all the water that falls on it then you can’t do better than the Genteele Memory Foam Bath Mats. Some bathmats offer non-slip backings. This can be very useful in a bathroom as it means that you don’t need to worry about the mat sliding around on the tile when you step on and off, or even just when you open to door to the room. When selecting a rug for your bathroom you will want to know that you can have a color that will fit I with your décor. Some mats come in only one or two colors, often very neutral tones, such as whites and greys whereas others offer more choice and brighter colors. The sizes of the mats vary greatly. Most come in a standard 20” x 31” size, which is a good size for sitting alongside a bath or at the entrance to a shower. If you have a larger bathroom you may prefer to have a runner sized bathmat. Runners are longer and can be a more suitable choice if you have quite a large bathroom and you want to cover up more of the tile. As these mats will be in a steamy bathroom environment they will invariably become dirty and in need of washing over time. Some mats can be easily washed and dried. Whereas others need to be washed with care and drip dried. These bath mats are available in a range of colors and sizes which means that it can fit into a wide range of bathrooms or even utility rooms. 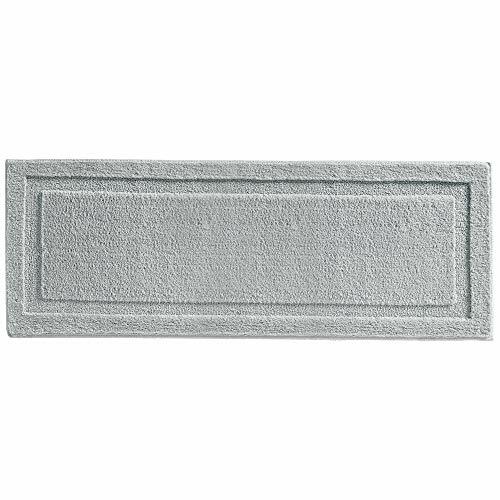 There is a large runner sized mat which is a great option if you have a larger bathroom. The mat is made of microfiber which means that not only is it highly absorbent but it also feels lovely and soft underfoot. The back of the mat has a very functional silicone backing that keeps it fixed in place on tiled flooring. On washing this mat can sometimes suffer a little, so you should make sure to wash with care. You may find, after washing, that the non-slip backing is not as effective as it was prior to washing. These mats are available in 5 different sizes, including a round option and a matching mat to go at the base or your toilet. There are six color options, include one nice and bright turquoise option. These mats are sold as being non- slip and this is mostly a function of the fact that they are quite heavy, rather than due to the coating on the bottom of the mat. As a result, they can still slide on some floors. The rug itself is made from microfiber, which is great at absorbing water. The design of the rug includes a fiber-locking technique which means that the mat survives machine washing well without any loss of fibers which can make bath mats look worn after they’ve been through the wash. Although it is recommended that you drip dry these mats. This is the original “Gorilla Grip” mat, it comes in only one size – 30”-20”. There are 8 color option, all of which are relatively neutral in tone. The grip on this mat is absolutely outstanding and works well on any surface. There is however a caveat to that statement. If there is any water, under, the mat then it loses its non-slip properties and will slide out from underfoot. So, if you are prone to splashing large amounts of water onto the floor, near your mat then this might not be the best option. It is very good at absorbing water that drops directly onto it, as you might expect from stepping out of the shower, it just can’t cope with water that gets underneath it. The feel of this mat is wonderful, you can feel your feet sink into the plush shag material. It is made from polyester but you would never guess that from the feel. The fact that it is made from polyester means that it does wash well and can also be tumble dried on a gentle cycle. These bath mats come in three sizes and six colors, with a mix of vibrant and neutral colors to choose from. These mats are truly luxurious with a layer of memory foam that cushions your feet as you step onto them, you may be finding excuses to go and stand on these mats they are so good. They have anti-slip dots on the bottom that works relatively well, but as with other mats, they can slide a little if a large amount of water gets underneath them. They work really well at absorbing water that drips off you after a shower, so well in fact that they can be a little slow to dry after use, this means that the next person in the shower might get cold water on their feet as they step into the shower. The slow drying also has an impact on laundering these mats. They are both machine washable and tumble drier safe, but they can take a while to dry. 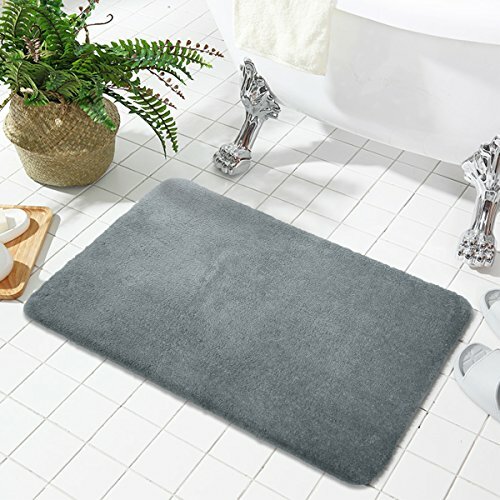 The Clara Clark Non Slip Memory Foam Tub-shower Bath Rug Set is a soft and sophisticated bath rug that gives your feet a fine feeling. Thanks to its microfiber material. With its non-slip, slide resistance feature, you are free from slipping and falling on wet floors. It boasts a lavish velvet and heavy duty design, which also guarantees a bacteria-free mat. This best seller set is perfect for your home, bathroom, healthcare facilities, dorm, or offices. Ultimately, after following the manufacturer’s instructions, the color doesn’t easily fade even after many machine washes. 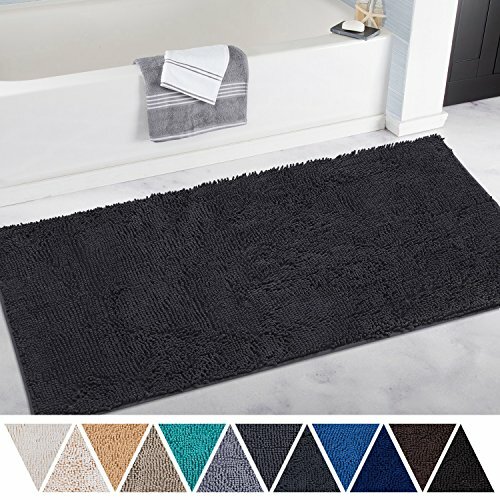 The DEARTOWN Non-Slip Thick Microfiber Bathroom Rug is a bathroom essential that is made up of chenille fabric microfiber, which is loaded with functional features. Talk about great absorbency, self-drying before mold and bacteria thrive, staying in one place without slipping and sliding around the bathroom. Well, it carries all these qualities to render. This 27.5 x 47 inches large mat is made up of the best materials to withstand heavy and long years of usage, even with constant machine wash. Why risk your loved ones with a low-quality rug, when you can own this versatile and comfortable carpet at a friendly price? The greatest thing about it is that it works well anywhere. In your home, bathroom, or healthcare facilities. Not only it creates elegance in front of your door with your favorite color, but even your beloved pets can enjoy it, too! The mDesign Soft microfiber Polyester Non-Slip Extra-Long Spa Mat is a 60 x 21 inches, and is designed for four major missions: Slip-resistant, durability, all-around comfort and ultra-absorbent. The high-quality non-slip backing provides long term performance, and it consistently grips the floor keeping the rug in place, even when wet. As a result, you can stand on it without slipping and falling. It is great for any age. It fits well in houses, bathrooms, sinks, front doors, kitchen and laundry room. 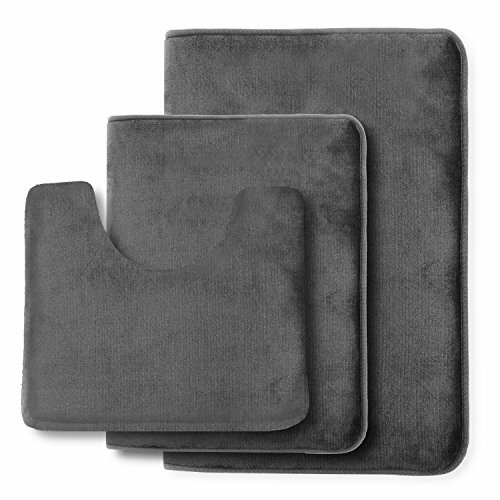 This easy to wash mat adds ultra-fine style to anywhere you wish to place it. It is super soft and highly absorbent, keeping your floors clean and dry. Available in different sizes and shape, it allows you to find the best rug according to your style. Make sure to follow the manufacturer’s directions when washing and drying for a long-lasting mat. The Utopia Towels Washables Cotton Banded Bath Mat is a pair of two that are made of 100% cotton, which provides a non-slip service. This bath mat set is 95gsm thick and measures 21 x 34 inches that give a heavenly feeling as soon as you step on it after a shower. 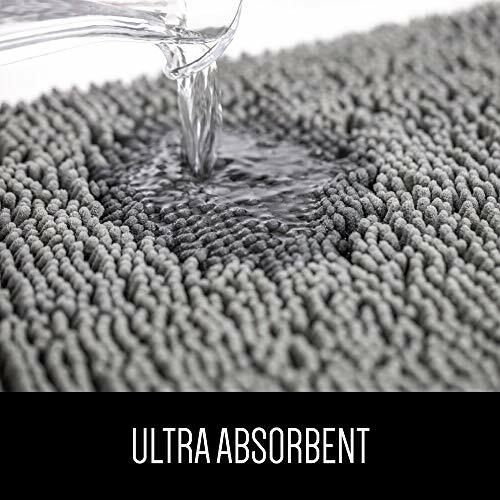 Each is extremely absorbent that spreads nicely on your floor. These low-cost mats are double-hemmed with a banded design to enhance their beauty and add attraction. 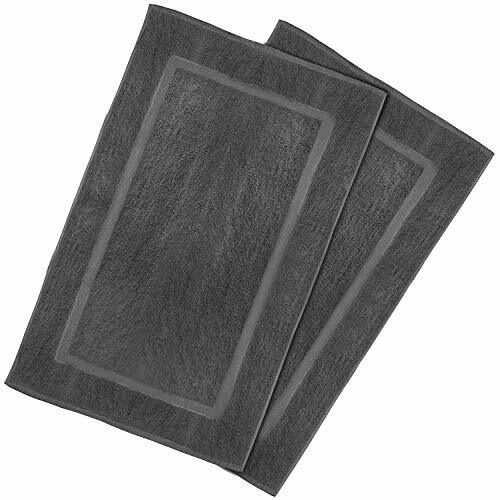 Soft texture, highly-absorbent, and non-rubberized backing make this pair dry quickly. You can choose any colors you wish, to compliment your interior decors. Carefully made with natural materials, these rugs are free from harmful and synthetic materials that assure your family’s safety. As per the manufacturer’s instructions, minimize bleaching and fabric softeners to lessen early damage. Lastly, wash the bath rugs separately to minimize lint. 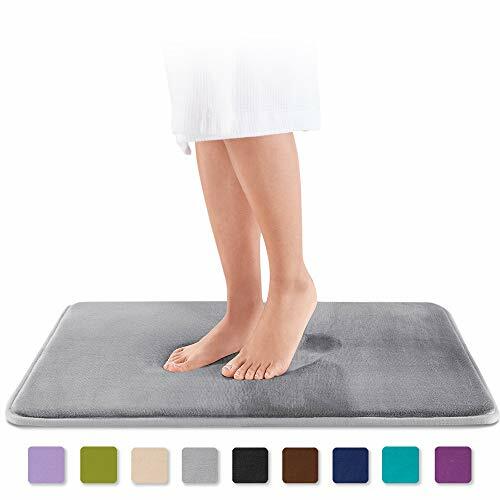 If what you are looking for is a bathroom mat that absorbs water well, then you can’t do better than the Genteele Memory Foam Bath Mats, not only is it fantastic at absorbing water, it is a pleasure to stand on. If you have small kids going in and out of the tub or elderly people in your house/are shopping older adults you may want to first look at these non-slip bath mats made with seniors in mind. Although they may not be quite as comfortable or absorbent as the ones on the list if safety is your first priority they may be a better fit for you.